Why write a job description for positions in your business, nonprofit, or ministry? Simple: you want to get things done. Good job descriptions are especially helpful for smaller organizations because staff, volunteers, and boards wear so many hats. By putting down a job description on paper, you’re forced to think through who is going to do it and when they’re going to do it. It’s a snapshot of a position’s responsibilities and the skills needed for it. The description outlines what the worker contributes so that your organization fulfills its mission. 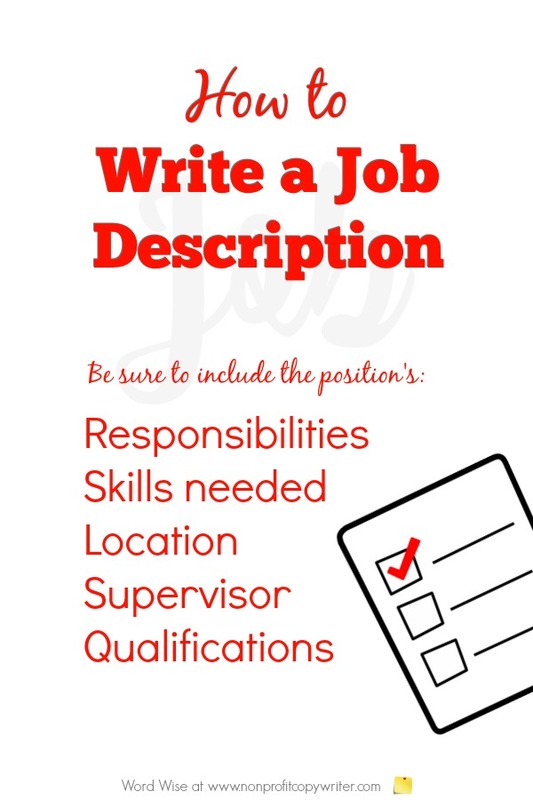 When do you need to write a job description? Not just when you’re posting a position on a nonprofit job board. Use a job description for paid positions, volunteer roles, committees or teams (including short-term commitments such as organizing events), and board members. Create them and tweak them at least annually (if not more often) during your annual meeting, staff meetings, and volunteer orientations in order to clarify everybody’s role. A good job description is big on clarity. It’s only as long as it needs to be. This checklist will help you include key elements when you write a job description for your nonprofit. Give the position a name that reflects its responsibilities. Use one (two at most) sentence to describe the position. List the position’s functions. Use bullet points to identify between five and 10 responsibilities, beginning each one with a present-tense, action verb such as, "recruit 10 annual sponsors for events" or "load up new donor contact information into fundraising software weekly," specifying frequency where possible. Indicate the percentage of the worker's time to be spent with each task. If your organization has its work divided into different program areas, specify which area this position serves. Answering this question helps the candidate, employee, or volunteer understand how her role fits into the whole unit. Distinguish between qualifications that are mandatory and those that are preferred, including skills, years of experience, certifications, licenses, education level, and necessary technical proficiencies. Faith-based organizations should link to their statement of faith to ensure that candidates understand their world view and organizational culture. List your organization’s niche, mission, goals, headquarters location, kinds of programming, and website. Interested candidates can delve further into specifics on your website. Describe to whom candidates should respond and what to include: a cover letter, resume, completed application. Indicate the means by they should respond, whether by email, surface mail, or phone. What's your USP (Unique Selling Proposition)?